The Pittsburgh Steelers have been showing interest in the tight end position and Cameron Clear out of Texas A&M has been on their radar. On Monday, the Steelers will bring Clear in to their Southside Facility for a pre-draft visit. Clear has a big frame at 6′,5″ and nearly 300 pounds. Clear had trouble finding playing time in the Aggies offense, but showed the ability to put together sustained run-blocking and help cover the edge rush. At the 2015 NFL Combine, Clear earned a low draft grade and put up a 4.48 second 20-yard and 12.07 second 60-yard shuttle time (both top performances at his position). His bulk has been a question mark for scouts who believe that unless he were to slim down, Clear may have mobility issues in the NFL. The Steelers will likely address past issues that Clear had off the field and rumors that the young end may consider converting to an offensive tackle. Clear may be a redzone option, but does not appear to be the type of tight end to stretch the field. With his height and blocking ability, Clear could be the type of player to come in on short-yardage situations and create play opportunities. His impact may be bigger on special teams until he is able to get into what many consider NFL-shape. Does it make sense for Steelers to go safety first? 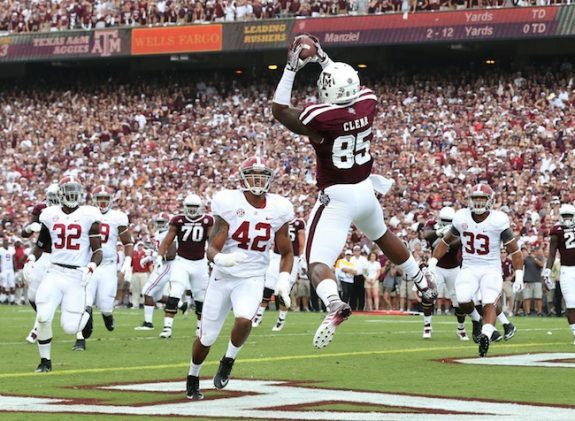 Be the first to comment on "Steelers to host Texas A&M tight end Cameron Clear Monday"